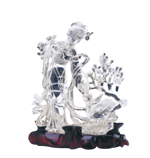 The art and practice of gemstone cutting is known as lapidary. With consummate skill, the lapidarist can turn a rough mineral fragment or water worn pebble into a sparkling and valuable gem. The techniques used have been developed over many centuries and these skills, when combined with modern techniques allow gems to be cut to obtain the very best effects from each mineral’s inherent attributes or special optical characteristics. Different cutting styles suit different gems. Transparent specimens like diamond are best faceted whilst the opaque gems, Agate, Onyx, Turquoise and Malachite are best cut as cabochons or as beads. The word Cabochon is a French word derived from the Latin ‘cabo’ meaning head or dome. Cabochons are the oldest and simplest way of cutting gems and the technique is still popular to this day. Larger pieces of gem material such as Jade are often carved, though it would be more correct to say ground, into figurines, animals, bowls, vases and other artistic forms. 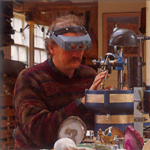 The faceting of gemstones was developed much later than carving and did not become commonplace until mediaeval times. The techniques were honed to their full potential during the last century. Today, we understand more about the physical and optical properties of gems and are able to measure the properties and how light is affected by them. The modern lapidary with this knowledge and the use of very sophisticated and accurate machines can cut more beautiful gems than ever before. The gem is worked into a pattern of highly polished flat planes or surfaces which we call facets and which act as mirrors. 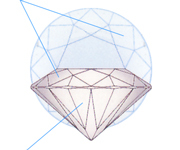 Some light reflects from the top crown facets and displays the gem’s lustre. Light also enters the gem through the crown facets and this is reflected off the bottom pavilion facets to re-emerge through the crown.